Sometimes you gotta' hand it to Safeway to directly market to customers in a particular neighborhood, such is the case with the one at Church and Market. 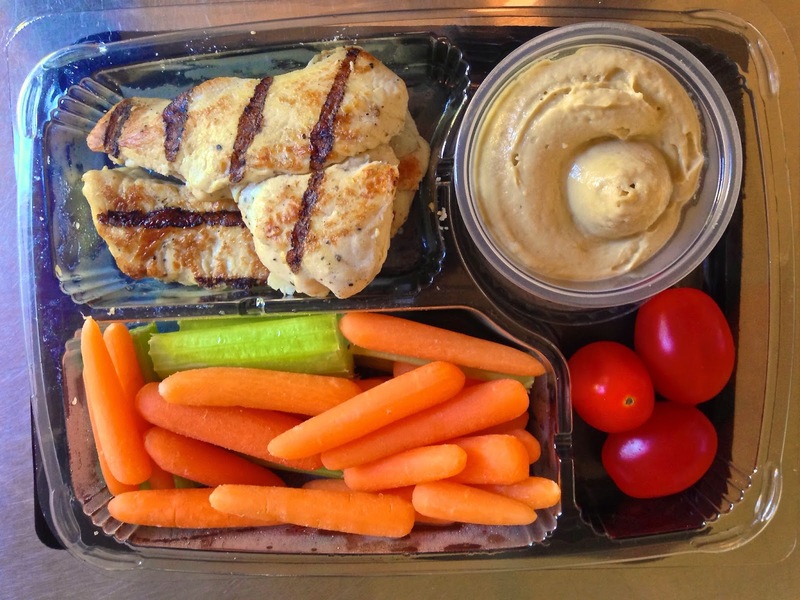 I just happened to be through there killing time one day and came across this little pre-packed selection they are calling the grilled chicken and humus box. Me, I'm gonna call it gay lunchables (that's not a slight--I owning it and buying it!) because it is offering up protein and veggies in a convenient grab and go when you are fresh out of your gym workout/bike ride/hike/yoga/whatever. I thought it was a great idea. Sometimes you don't want those useless cracker carbs or whatever else they pack up and pass off as snacks. This is a perfect fit, even for those of us who like to pretend we are occasionally healthy and aren't looking for some bready sandwich thing. It's hard to mess up the veggie part so those were fine. The chicken was on the dry side a tad and they need to fix that, it had good flavor though and hey, it had grill marks and pretty much hit the spot. For $3.99, I considered it a bargain bite for the on the go healthy snack concious gym boy (or girl) and for those of us pretending to be. Well done, Safeway, now if you could just offer this at your other locations as I have yet to see it anywhere but the Market/Church one. What? You don't think folks heading to AT&T Park want a quick healthy bite to wash down with their beer? Okay, maybe not, but this would pair really well with some garlic fries, I'm just saying. Bar Jules in Hayes Valley is closing, sort of. Seems she was ready to move on and sold the place. And lots of folks are terribly upset about it. Wild Food Week has started for all you forage fanatics and for those too lazy to go on a hike and look for stuff. Not only was Nakano fired, but Hapa Ramen has been closed and the entire staff laid off. See! Restaurants can also have their own brand of intrigue and back stabbing. The last Chevy's in San Francisco has finally closed. What will convention goers do now for cheap semi-Mexican eats that won't bust their travel expense budget? Ultra tiny new wine bar opening in town. She says she is bringing back the $8 glass of wine. I say what about the $6 glass of wine? That Aster place finally opened with (yawn) communal seating and biodynamic naturally produced wine vintages--umm what? Mijita at AT&T Park has closed, but don't feel bad for Chef Des Jardins, she still has plenty of places to keep her busy. Here's your first look inside the new venture from the folks who brought you Frances. Okay, so not everyone got fired from Hapa Ramen and SFist is clearing up all the madness. SFWeekly has a new food critic. They've upgraded Peter Kane to replace Anna Roth and plastered his photo online--anonymity be damned!